Oops - we don't appear to have a video for the M4099D. Fujitsu offers a production level duplex document image scanner designed to provide the ultimate performance, quality, and reliability. 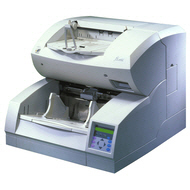 This scanner incorporates Fujitsus new "Dynamic Feeding" technology to bring total confidence to mixed document feeding : The Fujitsu M4099D document management scanner. Using "Dynamic Feeding" the scanner adjusts the roller tension in the feeder automatically to the optimum for the documents being fed. Fast and reliable with a daily duty cycle of 24000 A4 documents, this scanner has been expressly created to meet the rigorous demands of dedicated document and image-management applications. The M4099D comes as standard with both SCSI-2 and RS-232C/video interface capability.